Two of Google's most important programming projects were melded into one on Tuesday, as the company released the beta version of Chrome for Android. Available free in the Android Market, there's one big caveat: it only works on Ice Cream Sandwich. 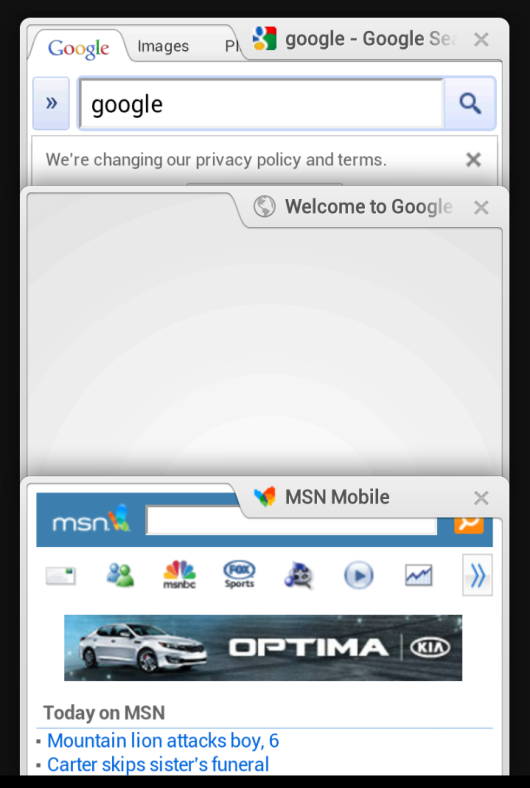 Another caveat: the Adobe Flash Player for Android doesn't work in Chrome for Android. Eventually, Chrome for Android will become the default Android browser. As you can on the desktop, you will be able to sync your tabs, bookmarks, etc. across "sessions" whether on the browser on your laptop or on your Droid 4. You don't have to sign in, but you'll be asked to do so as soon as you install. Think of it as an homage to webOS. Your tabs can really be imagined as a set of cards that you flip or swipe through. It wouldn't be Chrome if it wasn't speedy and Google is touting that. The Verge took it for a spin and managed a Sunspider 0.91 score of 1923.5ms with one tab open, while seeing 2175.1ms we in the old browser, for an improvement of 13 percent. To be clear, beta means just that: beta. It's got bugs, and stutters and stalls sometimes, but it will get beta. Hopefully it won't be in beta for years like Gmail. Watch a Chrome for Android video demo below.